Open House guests in Baytown at the office of newly elected Justice of Peace Lucia Bates. Seen are Pct. chair Hunter, State Rep. Carol Alvarado, Judge Bates, Former Constable Ken Jones, Former JP Tony Polumbo, and former Mayor Pete Alfaro. Congrats Judge Bates! 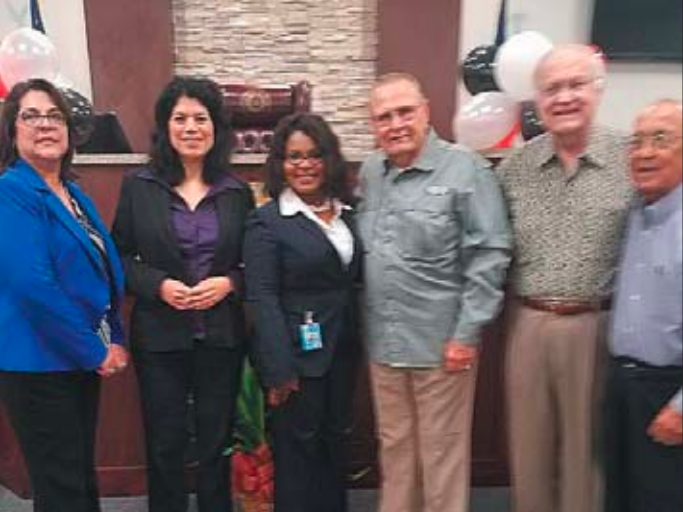 BAYTOWN – A meet and greet for Justice of the Peace Precinct 3 Position 2 Lucia Bates brought in some local legends to wish her well last Saturday. 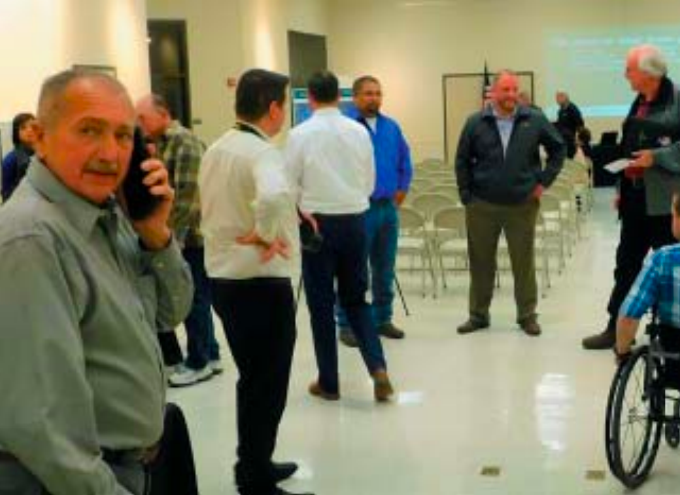 Mike Parrott, Tony Polumbo, Ken Jones, Pete Alfaro and Jason Rabelais came out to hear the new J.P. talk of working with young girls from her position — as her partner Joe Stephens, Justice of the Peace Precinct 3 Position 1, works with boys. She was later joined by Precinct 3 Constable Sherman Eagleton. Among other ideas expressed was that although misdemeanors bring youth into contact with the Justices the experience need not necessarily be punitive but an opportunity to grow and develop. Crosby residents carefully examine the graphic depiction of the neighborhood across the street from the Methodist Church on Runneburg to see the impact of floodwater in that neighborhood. Mike Foster of Harris County Emergency Management and ESD#80 talks with Jeremy Phillips of Harris County Precinct 2 Engineering. CROSBY – On January 15 the Harris County Flood Control District held a meeting to inform the public about partnering with the Harris County Engineering Department to address flooding issues in residential neighborhoods in unincorporated regions of Harris County with focus on stormwater drainage improvements and to receive input from the public. Voters approved $2.5 billion in bonds to finance flood damage reduction projects within the county. The county is moving forward with planning and construction of projects with bond funding, making effort to make transparent those projects to residents. This meeting was entitled Crosby MUD/Township Drainage Project and is listed on the Harris County Flood Control District website as HCFCD Bond Project E-12. Information can be obtained and comments made at www.hcfcd.org/E12 the district’s website.